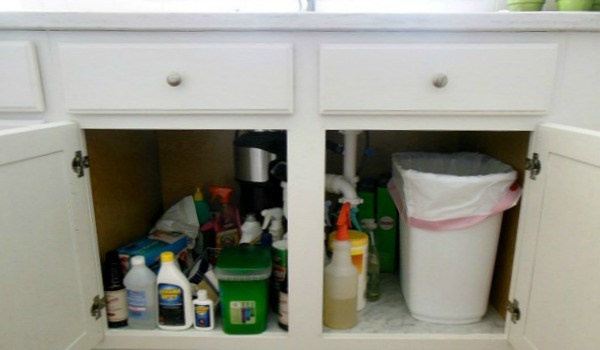 Learn how to organize under kitchen sink cabinet, so you can find the items you need easily! 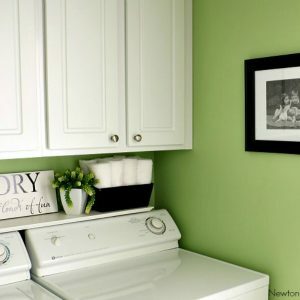 This is one of the hardest spaces to organize in your home! Ahh, the dreaded area under the kitchen sink! Do you dislike yours as much as I do mine? Actually, now that it’s organized, I don’t mind it as much! 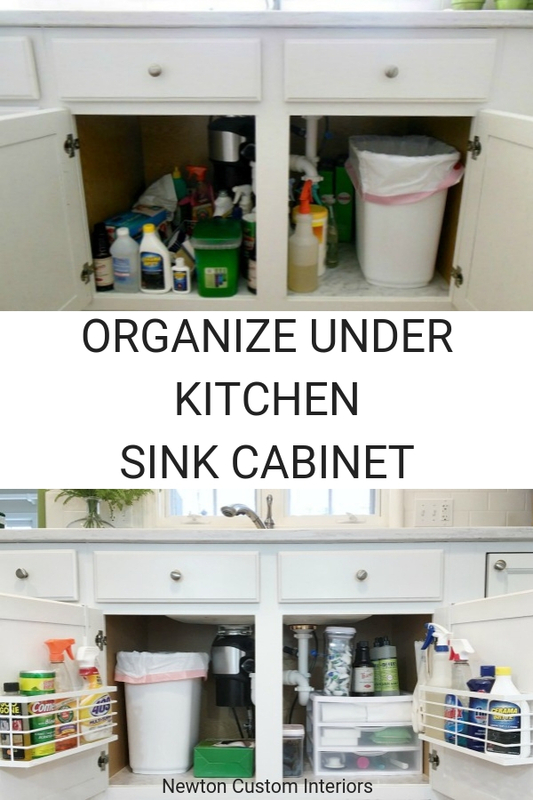 But, before the cabinet under the kitchen sink was organized, yuck! I couldn’t find anything, which is usually the main reason I organize messy areas of our home, I can’t find what I need when I need it! Here’s what our lovely under kitchen sink cabinet looked like before. One of the worst problems with the before is that I wasn’t utilizing the vertical space. Everything was on the bottom of the cabinet. There’s a lot of empty prime real estate above the cleaning supplies on the left side. Now that this cabinet is organized, I can easily find everything I need. 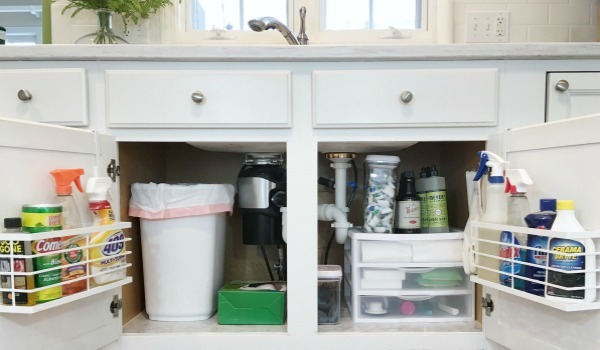 I’ve created a video which explains how to organize under kitchen sink cabinet. I share what my thinking was during the process, and the products that I used. I emptied the cabinet so that I could see what items I was storing there. Then, for each item, I decided if it was something that made sense to keep under the kitchen sink, could be stored somewhere else, or needed to be thrown out. While the cabinet was empty, I cleaned it out. After the cabinet was cleaned, I still didn’t put the items back in. 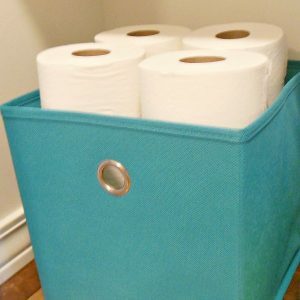 I knew I needed some organization products that would use the vertical space, and I also thought carefully about the placement of each item. These are the items that I used to organize and store items under our kitchen sink. 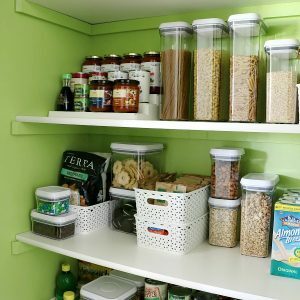 POP Canisters – I had these two organizers left over from when I organized our pantry. (You can read that post HERE). They work great at keeping the moisture out of the dishwasher pods and SOS pads! 3 Drawer Cabinet – This piece was key for utilizing the vertical space in the under sink cabinet! Over The Door Organizers – This is by far my favorite item that I purchased for this project! Next, I put everything back in the cabinets in a way that made more sense for us. For instance, I placed the garbage can on the left side so that it would be easier to get to the dishwasher pods when the dishwasher door is open. Our dishwasher is to the left of sink in the peninsula, so when the door is open, you can’t open the left cabinet door. The other items were put back in the cabinet in a way that made it easy to find them. The over-the-door organizers really helped with that! I’m so happy with how the cabinet turned out! Now I don’t get frustrated when I open the doors of the cabinet to find something! 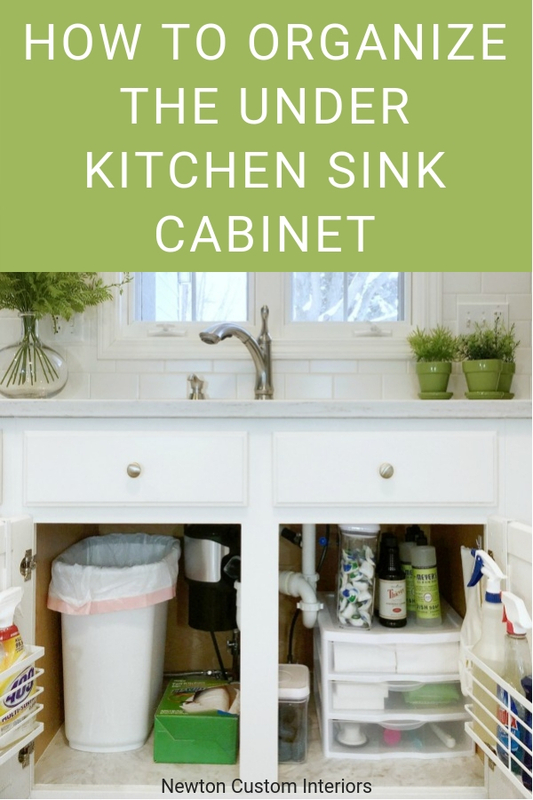 I hope you enjoyed the tips I share in this how to organize under kitchen sink cabinet post! This is definitely an area that I need to work on. Under the counters seem to be the last to do around here! Janet, it’s so easy to just close the cabinet doors and forget about the mess! It was the not being able to quickly find things that spurred me on to organize this area. I use baskets as well to keep everything organized. Works great. I love baskets too, but I thought plastic would work better than woven baskets under the sink. Organizing your space is so important. I am also in the process of organizing my kitchen and it makes a world of difference when you can find your stuff. Mary, I agree! I can’t wait to get my whole kitchen organized! These are some great ideas. I have a command hook on the inside of my under-the-sink door to hold the wet dishrag to dry when I’m finished using it. That way it’s not just flopped dripping over the sink divider. Using essential oils for cleaning also eliminates most of the big, plastic spray bottles under the sink. You still need a good spray granite countertop cleaner, though. Oils are too acidic to use on stone. Thanks Kay! I love your idea of the hook for the dishrag. Need to do that! Yikes! My space under my sink looks exactly like your ‘before’ picture. You’ve given me some great ideas, thank you! Yikes is right! It was a mess! Good luck with your project! This is great. I need to organize a little better under my sink. I loved the video too. Nice job!